Twenty-something guitarist Aksel stutters when he sings, and the latest reviews say he has the voice of a crow with throat plague. That's not a compliment, even for the avant-garde music his band Perkeros plays. Aksel is having a hard time keeping the band together, stopping his girlfriend from kicking him out, and not getting eaten by his drummer (who happens to be a cranky brown bear). There are also the rival bands that Perkeros find themselves in battle with to save the city from supernatural forces set loose by ancient music. The key to it all could be in the music Aksel hears in his dreams—if it doesn't drive him mad first. 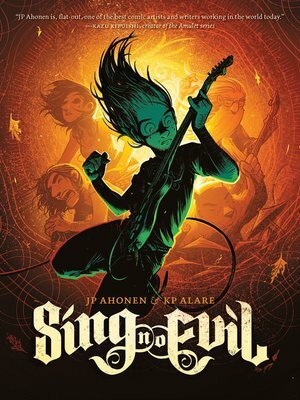 With a visual soundtrack that blasts off the page, Sing No Evil is a wild ride through otherworldly dangers and the power of pure rock'n'roll. JP Ahonen is the author of two Sunday comic strips in Finland. His work appeared in Kazu Kibuishi's Flight anthology. KP Alare is a graphic designer who spent his childhood drawing comics and his teenage years in hapless heavy metal bands. Ahonen and Alare live in Finland.